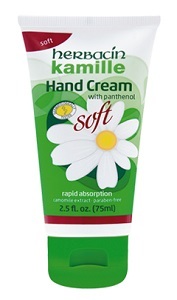 Herbacin Kamille Soft Hand Cream is a light, soft cream that the skin absorbs rapidly. It contains protective and moisturizing active substances such as Vitamin E, plant glycerin and Provitamin B5 in an especially mild formula which helps prevent the skin from drying out. The valuable active substances of Camomile extract, allantoin and Almond oil provide intensive care to the skin. Makes your hands smooth and supple. Dermatologically tested! Minimally fragranced! No parabens, no mineral oils, no animal-based ingredients, and no synthetic colors!